Foot Reflexology Charts & Reflexology Foot Chart Tips! Key elements in a reflexology foot chart! about reflexology zones & the meridians! The general purpose of 'reflex zone therapy' (a.k.a. reflexology) is to 'balance' the nervous system. Reflexologists usually use an approach where the body is divided into ten equal vertical zones: five zones on the right side of the body + five zones on the left side of the body. This vertical approach goes parallel to Chinese philosophy of the meridians; However, there is no direct connection between the 10 vertical reflex zones and 12 meridians, nor do these concepts directly relate to the physical nerve system. The word reflexology is derived from the so-called 'reflex arc', which refers to a neural pathway that controls an action reflex. Formally, there are two types of reflex arc: 'autonomic reflex arc' (affecting inner organs) and 'somatic reflex arc' (affecting muscles); reflexology can be associated with the first type. This implicates that foot reflexology should not be associated with casual uses of the terms: 'reflex', 'foot reflex' and 'primitive reflexes'. 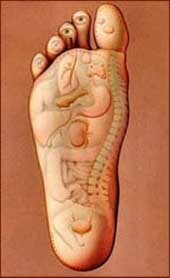 Unfortunately, there is no consensus among foot reflexologists about how reflexology exactly is supposed to work. 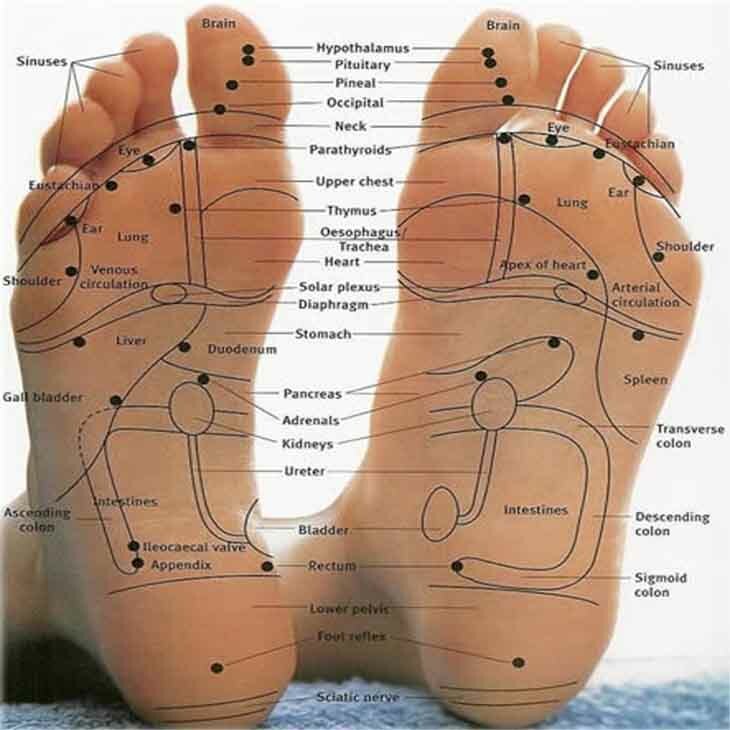 For example: in many foot reflexology charts the heart is located at the radial side of the foot - which sort of represents the opposite of the principle described by the meridian philosophy. NOTICE: likewise principles (+ disputes) are found for the hands in hand reflexology, and for the ears in ear reflexology! If you already know a little about foot reflexology and want to get started there are many useful reflexology foot charts available on the internet. 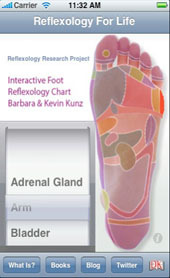 These concern usually printable reflexology charts, but sometimes the charts are available in various formats. While generally the foot reflexology charts tell a likewise story, sometimes an individual chart can show significant differences when compared to other charts. 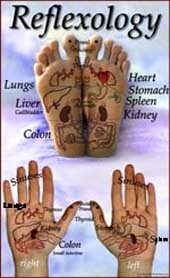 For example, in the first 2 foot reflexology charts below is the liver positioned in the right foot only; but in the third example it is also positioned in a small part of the left foot. And in the first 2 foot reflexology charts the stomach is positioned in both feet; but in the third example it is positioned only in the left foot. Another point of dispute appears to be... the heart: in the first and third example the heart is positioned at the inner side of the left foot, but in the second example it is positioned in the center of the left foot. More fundamentals of foot reflexology are described & discussed inside the section foot reflexology. What are the Major Differences between reflexology foot maps? How come that various charts present different locations for body parts? It is quite hard to answer this question, because usually it is a bit of a mystery how the experts have developed their foot reflexology models! 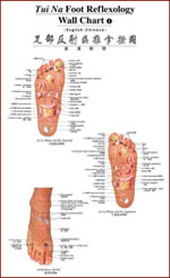 Below follow the high resolution examples of the various foot reflexology charts mentioned. 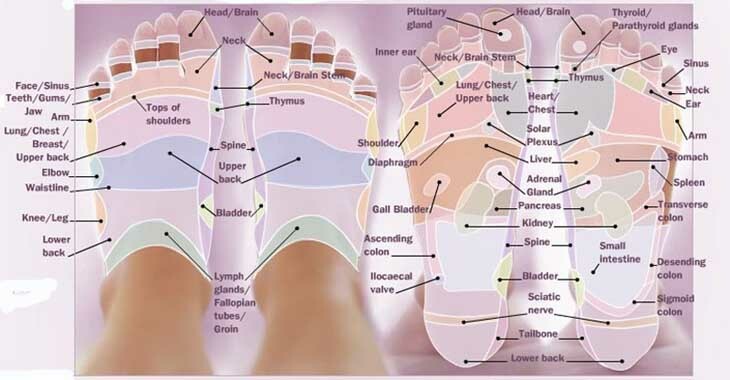 A reflexology chart is available for: the foot, hand, ear, face and body | Be aware of the minor differences that can be found in various charts! | Feet Charts for reflexologists courses | Free reflex zone charts | Diagram of reflex zone therapy for the feet hand reflexology diagram | Printable reflexology distance learning charts | Hand and foot reflexology charts. Interactive reflexology pressure point chart | Reflex zone therapy chart uterus | Acupressure diagram & reflexology diagrams are excellent tools for courses, classes & distance learning | Accupressure reflex therapy diagram for the foot, hand, and ear | Any reflexology diagram of the foot, hand or ear can show it's very unique characteristics! Reflexology foot chart - printable chart are available via many websites & other sources of expertise | Hand reflex zone therapy chart: free foot reflex chart | Ear + feet reflexology chart | Hand and foot reflexology chart: online reflex therapy classes chart | Reflexology face chart and reflexology wall chart | facial chart for expert reflexologists. More reflexology opportunities are found in: Certificated reflexology charts hands online | Free hand reflexology charts | Printable reflex zone therapy wall charts for the foot | Free reflexological chart: what is the purposes of the chart/map | Reflexologist massage, acupressure chart, and reflexology training - including how to acquire a certification.